Our need of Christ does not cease with our believing. Your study of physics and other sciences is not worth a rush, if it be not God that you seek after in them. To see and admire, to reverence and adore, to love and delight in God, as exhibited in his works -- this is the true and only philosophy; the contrary is mere foolery, and is so called again and again by God himself. This is the sanctification of your studies, when they are devoted to God, and when he is the end, the object and the life of them all. Though not as eloquently, I have thought this many times myself. It has been my philosophical struggle while teaching in a public school. Even in a "Christian" school, this can be a danger. 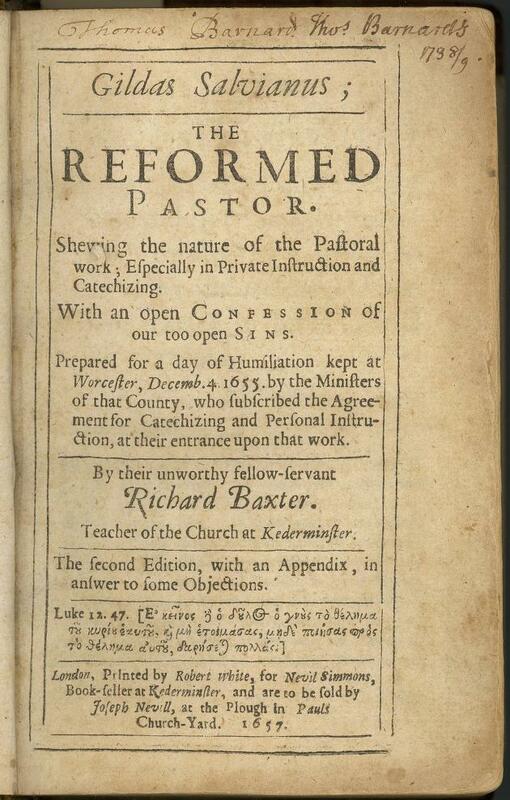 Consider the rest of what Richard Baxter has to say on this topic. And, therefore, I shall presume to tell you, by the way, that it is a grand error, and of dangerous consequence in Christian academies, (pardon the censure from one so unfit to pass it, seeing the necessity of the case commandeth it,) that they study the creature before the Redeemer, and set themselves to physics, and metaphysics, and mathematics, before they set themselves to theology; whereas, no man that hath not the vitals of theology, is capable of going beyond a fool in philosophy. Theology must lay the foundation, and lead the way of all our studies. If God must be searched after, in our search of the creature, (and we must affect no separated knowledge of them) then tutors must read God to their pupils in all; and divinity must be the beginning, the middle, the end, the life, the all, of their studies. Our physics and metaphysics must be reduced to theology; and nature must be read as one of God's books, which is purposely written for the revelation of himself. The Holy Scripture is the easier book: when you have first learned from it God, and his will, as to the most necessary things, address yourselves to the study of his works, and read every creature as a Christian and a divine. Think not so basely of your physics, and of the works of God, as that they are only preparatory studies for boys. Do you think this way about theology? Do you believe that it must lay the foundation of all that you believe? Are all of our other studies worthless without this basic understanding of all that is? Buried in these thoughts are the challenges that I face teaching at a public school. What if I succeed in educating a child, but they have no concept of the origins of knowledge? Should there ever be a secular education? The deeper question is this... IS there such thing as a secular education? Do we not teach something of theology when do not mention God? Do we not teach His attributes when we present a world devoid of Him? Do we not expound on His nature when we study a nature that is apart from Him? Do we not tell His story when we teach history without His providential hand? 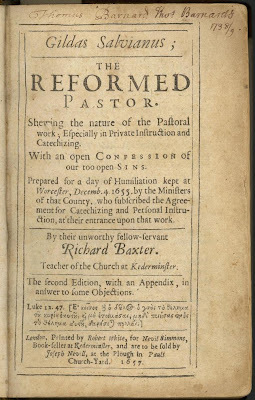 I know I've talked about this before, but as I read this portion of Richard Baxter's book yesterday, I was reminded once again of my ongoing philosophical dilemma. My wife is helping a friend with her blog and her social media stuff. The blogging platform that she is using is Worpress. As you can tell from the title to this post, after spending a portion of my evening trying to figure it out, I now officially hate Worpress. The interface is cluttered and, well, just ridiculous. I guess I'm spoiled though. The Blogger interface is so streamlined. It is friendly to the mind and to the eyes. What I can't figure out is why anyone would ever switch. I just don't get it. Here is a youtube video from Blogger, highlighting their new look. I finished the book God in Action by Karl Barth about a week ago, but haven't had the time to devote to writing a proper book review. I still don't have the time, but I would like to take a moment to post a quick review, one not quite worthy of the book. God in Action is one of Karl Barth's early theological works. It is a compilation of a set of lectures. I have read that this book is a great way to get an understanding of Karl Barth's theology. I found that its primary focus was on the authority of scripture and the reality of the Church. He would define and reiterate the necessity of understanding the doctrines related to these topics. As he discussed each, there was an emphasis on a logical flow of thought, this is what drew me in. God in Action made me think. I've had a couple of posts quoting this book already. You can read those posts here and here. There were several other occasions where I felt that a particular statement had earned blog-quote status, but they didn't make it there because of a lack of time. I was drawn to his statements because of that analytical approach. It permeated every page. I was a little disappointed at his lack of scripture use. In his defense, it wasn't meant to be a scriptural exposition, but a verbal discourse on the topics. Nevertheless, I always appreciate an appropriate amount of proof-texts in relation to a theological work. I guess I've been spoiled by Wayne Grudem's Systematic Theology. I would still recommend God in Action to any of you. It was challenging at parts, but well worth the read. It is currently less than $3 through Amazon. Click the link above to go to the purchase page.